This offers a couple of advantages over the classic toggle. Obviously, you can remove the bolt and re-install it, so you can easily remove whatever you attached to the wall without having to start over. It’s also possible to easily install other bolts of the same thread pattern. For example, this week I was installing Hungarian-style shelves to hold media equipment, so I needed to attach some 2x6s to the wall. The 2.5″ bolts that came with the kit weren’t going to work, so I picked up some 4″ bolts from the next aisle over and used them instead. Hell, if you really wanted to, you could even remove whatever you attached to the wall the first time and install something else in the same holes with different bolts. They install extremely fast, as well — it took me a minute or two to install 20 of them. 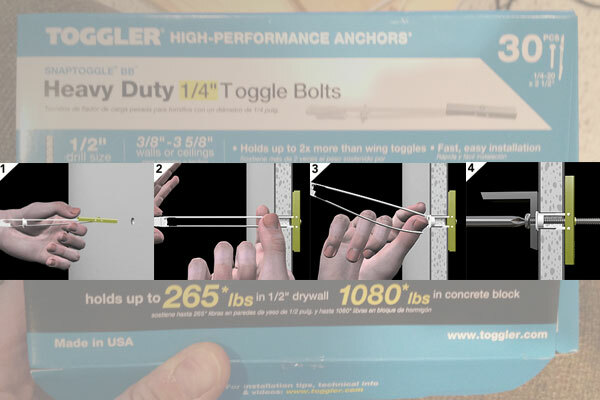 Toggler offers these in a variety of bolt sizes ranging from 3/16″ (24 thread, rated to hold 238 pounds in 1/2″ drywall) up to 1/2″ (13 thread, rated for 275 pounds in 1/2″ drywall). Pricing varies based on size and quantity, but you should expect to find two-packs and 30-packs in your local big box. (We’ve seen them online in 50-packs, too, so YMMV.) We paid around $22 for a 30-pack of 3/16″ anchors. I’m definitely a fan. But hey, if you like something else better, let us know in comments. We’re always looking for the best parts like this. And I’ve got a ton of projects in the queue around the house, too, so I’m sure I’ll need some more before I’m done. I couldn’t agree more. Ever since using them for the first time last fall, I’ve kept some on hand at home. Their simplicity, and design are such a huge improvement over almost any other wall anchor. I had a neighbor help me hang some cabinets last year and he pulled a couple of those out, saying they are the only anchors he ever uses any more — everything else is “junk”. My only question is eventual removal. When the day comes that you need to patch over that anchor, can you get them out without making a 1″ hole? When I’ve needed to get rid of the anchor, I haven’t worried about removing it from the wall. I used diagonal wire cutters to snip off the cap and let the toggle part fall into the wall, just as you would with a standard toggle. Patch the hole and you’re done. I’ve been a big fan of wingits, but the major drawback with them is that you have a huge honking hole in the wall if you ever need to get rid of them. I use these to hang monitors in high traffic retail stores all the time. Definitely the best anchors I have ever found. Hilti was selling a similar product at Home Depot before they pulled out. I discovered these when I ordered a new pot rack a while back and the hardware pack included some of these to anchor the bolts to hang the rack. I fell in love with them and have used them for everything since. I found these probably 8 years ago when hanging some old fashioned TV shelves and have loved them ever since. Another advantage you don’t mention is that if you’re hanging something that requires multiple anchors, you don’t have to try and line up/insert multiple toggles at the same time. One problem I’ve found recently is that the threads aren’t always cut cleanly, so now I thread a bolt in and out before inserting the anchor. I found that problem when installing some into metal studs and the bolt turned the anchor which caused the burr on the metal to cut through the plastic straps. I lost several toggles before I realized what was going on. I’ve always liked E-Z Anchors. The metal ones are great and I’m amazed how much they can hold. Plus- they’re removable and reusable. The plastic ones aren’t as good, but some guys like them. I like the E-Z anchors too. For the same reason they are reusable and make easily patched holes. Another vote for E-Z Anchors. Nothing has worked better for me in drywall. Unfortunately, I have a lot of plaster walls. You are mistaken, OR, you are using the “new” plastic E-Z Anchors, OR the new shorter ones. I’m now trying to find somewhere that still sells these old E-Z Anchors. Copies are never as good as the originals. No you are mistaken. You put a shelf up and the original poster says it does not work well when you pull or turn on them like towel and paper towel holders. These are firm for awhile but eventually soften up. A shelf isn’t getting torque’d on. Absorb what you read instead of wanting to hear only what matters to you!! People keep confusing heavy loads versus heavy duty use. I don’t care if something can hold a heavy shelf. AS soon as you have something that requires strength from keeping it from turning or pulling straight out of a wall, instead of the downward force, that is when 99% of the anchors fail over time. Single bar towel holders are notorious for weakening up with EZ anchors no matter the type. They can’t handle the rotation in drywall. That’s why these toggles are getting rave reviews. I love hearing all these construction guys wanting to defend their own product, but the failure rate after a few years is so high on heavy duty use and why i will never use an EZ anchor again nor any other type of wall anchor. I can easily do a nice patch job on a hole. Most contractors just install and have no idea the fail rate on their work. I liked these, but ran into a problem putting them into a wall that had been heavily insulated with fiberglass batts – the toggle wasn’t able to expand, and with my attempts at manipulating it I managed to snap the plastic bits off and had to discard the anchor. Anyway, this happened a few times and I ended up needing another hardware store run to get some more in order to finish mounting the set of cabinets I was putting up. With all that having been said, I’d still use them again for anything needing significant load. I’m a big fan of the WallDog. Works for most of my needs. If I need to remove, I don’t. I hit the head with the back of a screwdriver to recess, re-tighten and spackle over it. Walldogs and EZ-Anchors are in a different category. Personally the walldogs are the worst. They never seem to hold tight and strip out the rock if you put to much pressure on them. EZ-Anchors are great for light loads. Our preferred light duty anchor. For heavy duty all we use are snap toggles if we are forced to mount to drywall. We even use them if mounting to plywood or steel plates behind drywall. I am glad to see this review as I bought some for the first time last weekend and will probably use them this weekend to aid in mounting a baby gate at the top of my staircase. Thanks. A little vector diagram will show how the load on an anchor will impact its ability to work effectively. A heavy – but thin mirror will apply in mostly downward (shear) force to the anchor. A shelf – especially wider ones that are loaded near their outer edge – will apply much more pull-out force on the anchor. Finally something like a grab bar in a bathtub – can apply lots of pull-out force as it is used to help someone out of a tub. In the last case – we’ve found that no hollow-wall anchor is up to the job – and for new construction we recommend tub enclosures that start with ¾ inch plywood over the studs as a point to anchor grab bars. These are the beat hollow wall anchors for heavy loads no doublt. Very installer friendly. In fact all of the Toggler brand anchors I have used have been my favorites. The alligators are great for masonry and light hollow wall use. The togglers are slightly better light duty hollow wall use also. They aren’t as versatile as alligators so I usually don’t bother with them. Another plus is the initial hole is smaller than with traditional toggle bolts. When I was doing professional AV work we always kept a few boxes in the van. Occasionally you’ll get one with bad threads or stubborn zip mechanism. Overall a great product. Contractors 30 pack at Lowe’s, to my knowledge, best value. These are the bomb and no more searching for studs through old cement walls!!!!! Use alligators for general use and toggler anchor for drywall. Tiles over drywall use the alligators. For heavy jobs use snaptoggle metal anchors. Never had one fail me once installed properly. Every time I use these snap toggles, after I cap it and try to put the screw in, it falls behind the wall, and does not stay put. What am I doing wrong? This happened twice. These are amazing tools…easy to use and holds like iron. Truly worth the cost, which is very reasonable. Very nice anchors indeed, but I won’t use them because the execs are complete and total assholes. Question to those who have used these in the past. I’m looking for an anchor that will allow to be used over and over. Meaning, i want to install a bracket on the outside of an RV but remove the bracket each time I travel to next location. Will the toggle stay in the wall if I remove the bolt until I get to my next location? Or maybe put the bolt back in once bracket is removed until next use? Will it hold up to this continued use do you think? did you post your comment on the wrong website, or did i miss some subtle connection to hollow wall fasteners? His name contains “Algerie”, what do you expect, to see logic? I’ve been using them in plaster over gypsum block. The block has 1.75″ diameter tubular channels running horizontally, which is too small to allow the standard sized 2″ SnapToggle to expand. I use a hacksaw to cut the toggle down to 1.5″, and that works. It’s not emphasized in the directions, but it’s important to install the toggle vertically if you’re expecting a heavy vertical radial load like a large shelf or a bathtub grab bar. I’m using them to install heavy duty monitor arms, which apply both horizontal and vertical radial loads, so I install the toggles at a 45 degree (2 o’clock & 8 o’clock) angle. I do grab bar installations & use these togglers when ever possible. One per each end gives me a rating of over 450+ lbs. In some cases the distance between the drywall & an adjacent wall or obstruction behind the wall isn’t deep enough to flip the anchor. In these cases, I’ll trim the anchor and use two at each end. For fiberglass tub surrounds however, my first choice is the Moen Secure mount system. Here too you may have to occasionally MacGyver a solution because of the lack of space. But that’s for another discussion. Anybody use the snaptoggles in an exterior stucco wall? I’m looking for a way to mount a 50lb wrought iron cage. I bought these for a heavy wrought iron railing for my stairs. The railing is not long enough to go into both studs. Do you think these will work? As a handyman, a few years ago I was faced with the problem of just how to rectify a poor job by a tradesman who had failed to place noggins in the very places they were required to support heavy towel rails, toilet roll holders etc on a very unforgiving porcelain tile surface. The problem was that all dry wall anchors on the market dig into the rear of the plasterboard by virtue of their shape and it is impossible that the supported items will remain a solid fixture. With the anchor I designed and made, not only will the supported fixture never become loose but the anchor will always mount dead centre of its desired mounting position and be reusable without falling down the behind the wall when the fixing screw is removed, able to be placed vertically, horizontally or any where in between, and when the time comes that you may wish to remove the supported item and fill over the hole, there is no protrusion on the drywall surface that will need to be hidden or removed. Not only that, they are uncomplicated, inexpensive and will support whatever weight you may wish to place on them. I am about to hang three 7 foot shelves that will hold a ton of stuff, with each using three shabby chic brackets with four screw holes per bracket. These are going to be perfect Thanks!